A native Tucsonan, Bob Davis attended Palo Verde High School where he swam on three state championship teams (1963-65), and was junior and senior class president. After graduating from the University of Arizona, he coached at Tucson High before becoming head swim coach at the UA, which had finished in last place in 1972 in the Western Athletic Conference. By 1975, he had the Wildcats atop the WAC, winning four straight league titles. As coach of the Local AAU swim team, he coached the first Tucson-area swimmer to qualify for the U.S. National Team (Jill Strong), who was also the first Tucsonan to medal in major international competition. He also coached the first Tucsonan to make a U.S. Olympic team and to medal at the Olympics (Doug Northway). At the UA, Bob coached the school’s first All-Americans (multiple), and led the Wildcats to the first-ever finish in the top 15 in NCAA championships (1976-78). 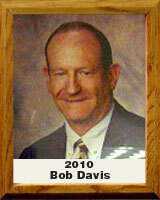 Bob also had a perfect record against Arizona State in conference and national championship competition. He was associate director of athletics at the UA from 1978-85, serving three athletic directors, two presidents, two football coaches, and three basketball coaches. In 1985, Davis decided to try his hand in the private sector, and has been quite successful. He is now senior vice president of transaction services for global real estate company Grubb & Ellis. His resume includes numerous boards of directors and advisory boards.